Important! While the other two assessments are sold individually, the Leadership Style Assessment is only available in this book. Distinctive Element: Team Leadership takes students beyond a basic understanding of leadership to a practical, in-depth look at what they can do to develop their leadership potential. It helps students understand their role in the context of a team by giving them a clear understanding of their natural leadership tendencies as well as their destructive habits. By completing these assessments, students will grow in exciting new ways as they take their team to new heights of performance. Discover their leadership strengths and weaknesses. Find a leadership role that fits them. Learn to work together more efficiently. Gain momentum and unity in their teams. Leadership Type: What am I most passionate about on a team? Leaders who understand their leadership type are able to capitalize on their strengths and overcome their weaknesses. 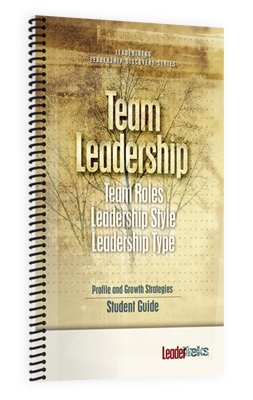 This assessment identifies the four main leadership types, each with its own positive and negative characteristics. Students who take this assessment will determine which type of leadership they naturally utilize. They will also learn to value the other types of leaders on their team. For additional details, go to the Leadership Type page. Leadership Style: How do I tend to lead a team? All leaders struggle to balance their focus on relationships with their need to accomplish important tasks. This assessment helps students discover whether they are relational, task oriented, balanced or adaptive in the way that they lead. Understanding their leadership style will give them a window into their leadership potential as well as target areas for improvement. Team Roles: Where do I fit on a team? Every member of a team contributes in specific ways, either positively or negatively. This assessment outlines three categories of team roles that every person plays – task roles, social roles and destructive roles. Students discover what roles they naturally play and which roles other members of their team play. This assessment is extremely valuable for developing teamwork and empowering leadership. For additional details, go to the Team Roles page. Team Leadership in Action – What next? Every great leader understands the value of application. Without application, there is no life change. This bonus session is devoted entirely to applying the lessons learned from the three team leadership assessments. Expected outcomes include: Applying the knowledge gained, developing stronger individual leaders, improving team performance, and impacting God’s Kingdom.